// In collaboration with Theater im Ballsaal Bonn, Malévoz Quartier Culturel, Théâtre du Crochetan Monthey (CH). // Funded by: Ministerium für Familie, Kinder, Jugend, Kultur und Sport des Landes Nordrhein-Westfalen, Bundesstadt Bonn, Théâtre-ProVS, Le Conseil de la Culture Etat du Valais, La Loterie Romande. “Exhausted is a whole lot more than tired. The tired no longer prepares for any possibility (subjective): he therefore cannot realize the smallest possibility (objective). But possibility remains, because you never realize all of the possible, you even bring it into being as you realize some of it. The tired has only exhausted realization, while the exhausted exhausts all of the possible. The tired can no longer realize, but the exhausted can no longer possibilitate. 'That the impossible should be asked of me, good, what else could be asked of me?" Does he exhaust the possible because he is himself exhausted, or is he exhausted because he has exhausted the possible? He exhausts himself in exhausting the possible, and vice versa. He exhausts that which is not realized through the possible. He has had done with the possible, beyond all tiredness, "for to end yet again." "As soon as the three men find their voice and roar, the piece stops. Even before the language, the philosophy, the politics. 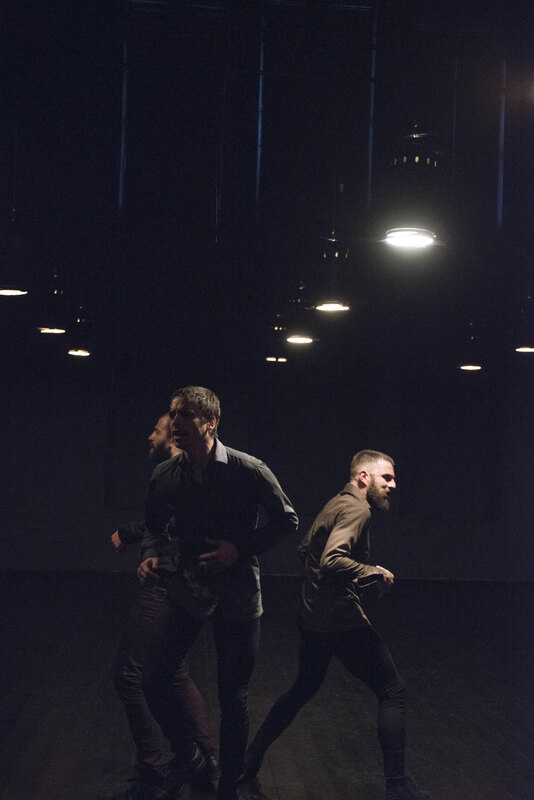 "Momentum" by CocoonDance, the Bonn-based ensemble of choreographer Rafaële Giovanola and dramaturge Rainald -Endraß, is embodied physics, in the sense of "impulse" or "momentum". 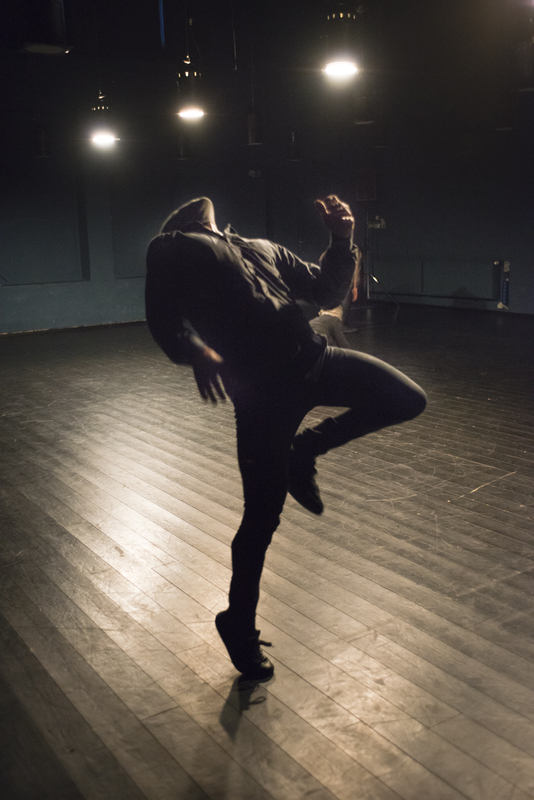 This is also precisely how the dance bores itself into the “moment”, the raw moment. The location is a kind of cave, which also surrounds the audience: You stand anywhere listening to the mountain and its beats inside. DJ Franco Mento makes his electronic sound swell up and down, grow thicker and thinner, but it never pauses. The spectators eventually surrender to it by moving their heads to the beat. It takes a while for the dancers. First they are lying down, as if dropped down. Something jerks inside of them, arching, tensing, slowly pushing them on. They crawl, slide, lurk, always close to the ground, apparently blind, with their heads wrapped, anonymously. (...) In general, the (gender) difference turned out to be a secret leitmotif of the festival, especially where the principle of gender-neutrality is otherwise applied notably in a rigid way. 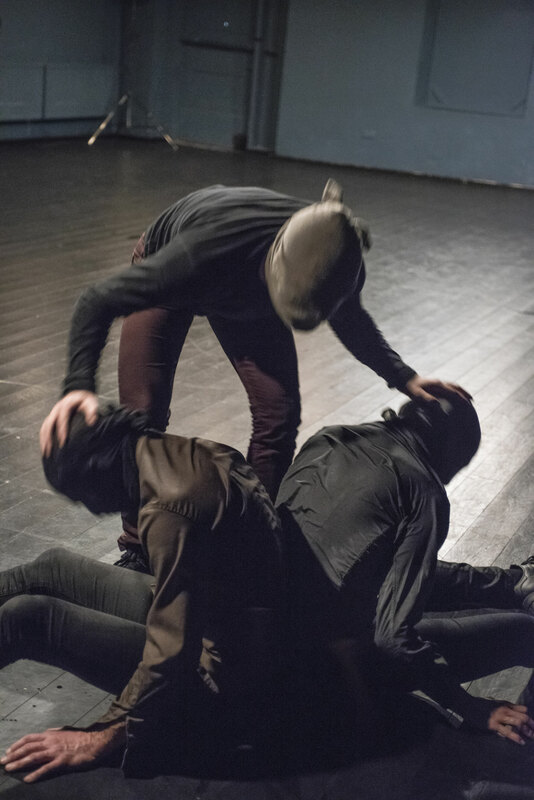 Two performances staged male and female bodies so unabashedly that not just gender-fetishists went almost blind and deaf. 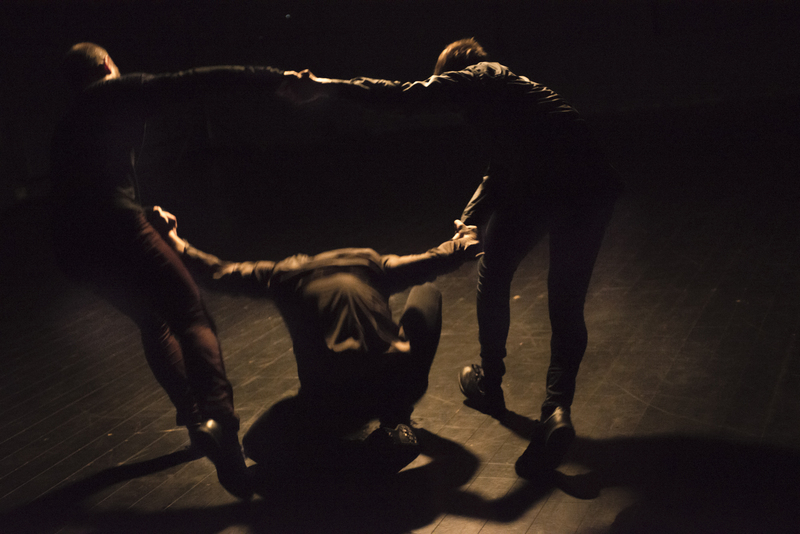 The audience, in unison, succumbed to the lure and ecstasy of movement ignited by the three stocking masked young men in Rafaële Giovanola's "Momentum" arena. 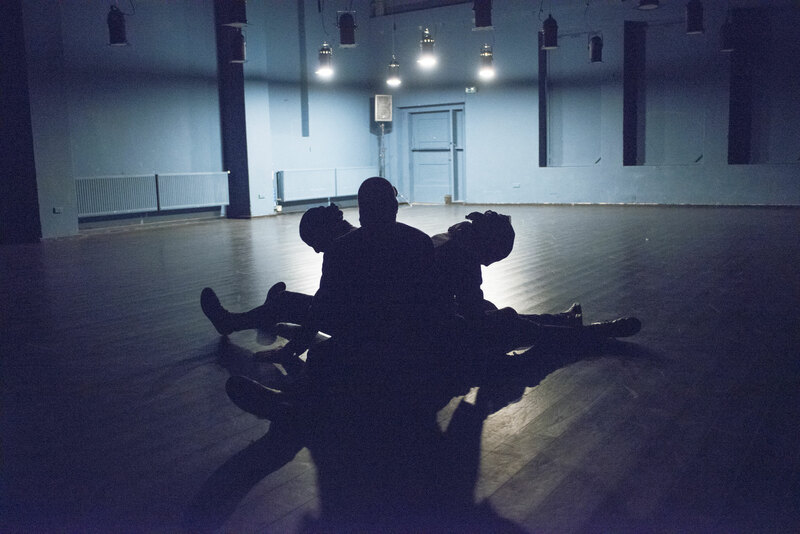 "Whether politics can dance (or one can dance politics) or how dance can politically present or position itself - that could be the guiding question of this year's Tanzplattform. 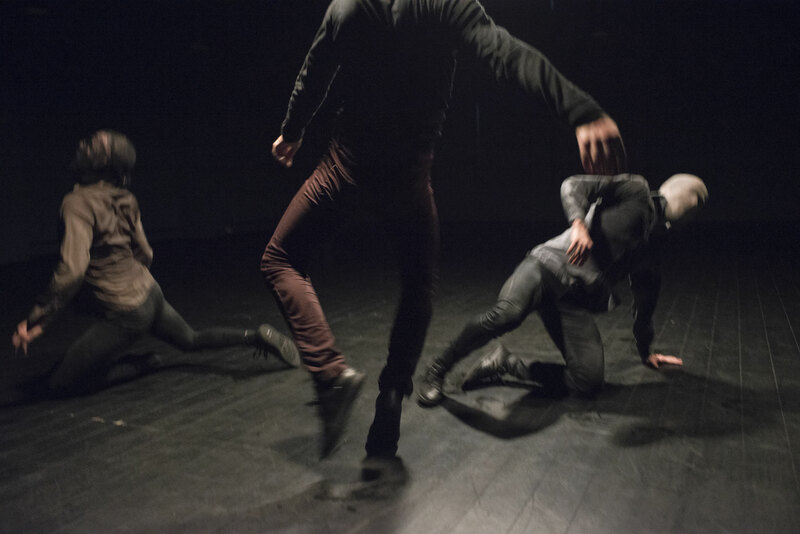 “... a virtuoso etude about movement and how movement is perceived using intelligence and sensuality to play with the complex relationship between dancer and spectator. 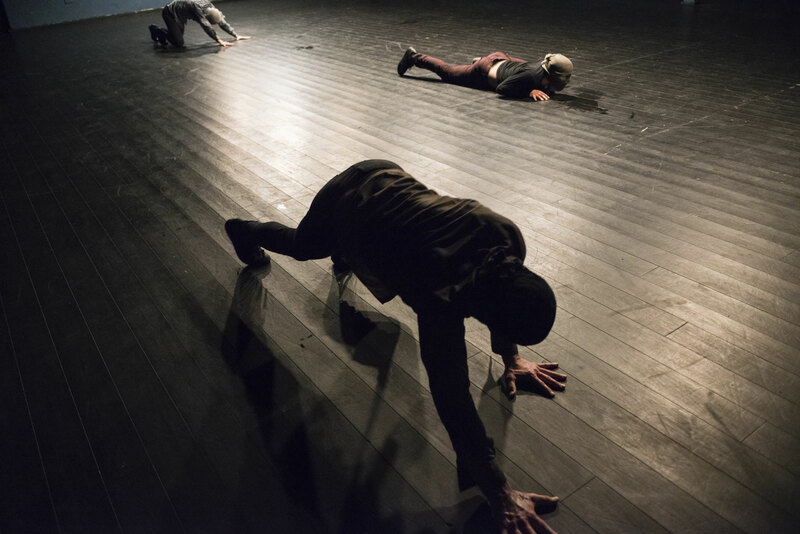 Although the three dancers are undertaking a physically demanding high-performance program while the audience remains in a basically passive state, both parties are nevertheless actors. 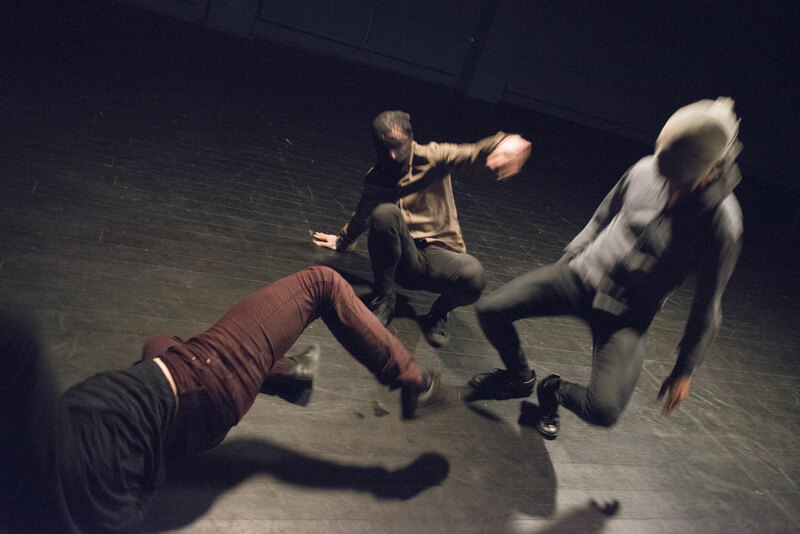 "The main attraction of the last festival night then was then "Momentum", one of the successful choreographies in the repertoire of the Bonn CocoonDance Company. 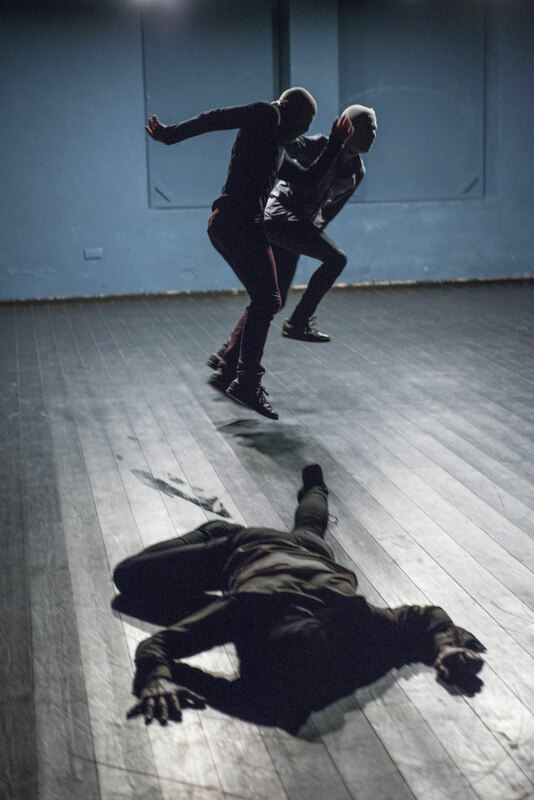 (...) Everything in this choreography is leading to an increasing energy.